VeryDOC PDF to Image Converter is a Windows/Linux Command Line application that allows you to easily convert PDF files to lots of image formats. PDF to Image Converter is fast and easy to use, it is the best tool for the work of converting PDF files to image files. PDF to Image Converter can convert PDF to TIFF, PDF to JPG, PDF to PNG, PDF to GIF, PDF to BMP, PDF to EMF files, etc. 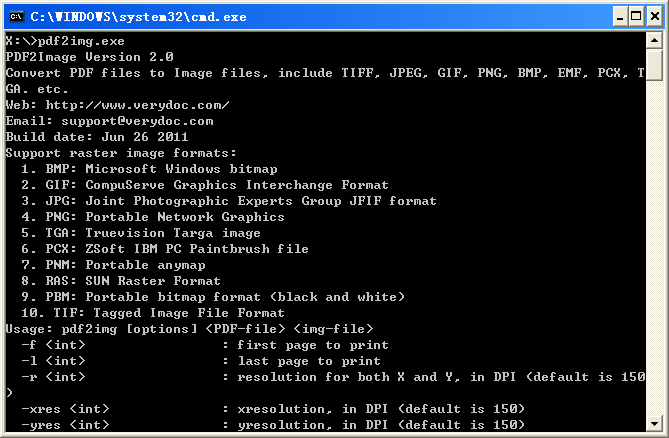 VeryDOC PDF to Image Converter Key Features: 1. PDF to Image Converter is a standalone software, Adobe Acrobat and Adobe Reader NOT required! 2. PDF to Image Converter support lots of languages. 3. PDF to Image Converter support wildcard character for batch conversion, for example: *.pdf. 4. PDF to Image Converter is support batch and unattended operations. 5. PDF to Image Converter is able to extract a page range from an existing PDF file to image files. 6. PDF to Image Converter is repair damaged PDF files automatically. 7. PDF to Image Converter supports all versions of PDF files, from PDF 1.1 to PDF 1.9. 8. Able to set compression quality to jpeg images in output JPG files. 9. Support both 32bit and 64bit systems. 10. Support Microsoft Windows 9x/NT/2000/XP/2003/vista/7/2008/etc. Windows Operating Systems. 11. Support CentOS, Debian, Fedora, Gentoo, Slackware, Ubuntu, etc. Linux systems (Linux version only). 12. PDF to Image Converter support batch conversion, you can convert any number of PDF files to image files at one time! 13. PDF to Image Converter converts PDF to TIFF, PDF to JPG, PDF to PNG, PDF to GIF, PDF to BMP, PDF to EMF files, etc. 14. PDF to Image Converter support high speed converting. 15. PDF to Image Converter is able to accurately preserve text, pictures, and layout of the original PDF. 16. PDF to Image Converter convert PDF files to Faxable Class-F TIFF files. 17. PDF to Image Converter is able to create monochrome, grayscale, and true color image files from PDF files. Professional yet efficient publishing barcode label maker software is a helpful tool to the user to design attractive barcode labels and tags for managing the books records and details in easiest manner without any experts? help or technical skills. Uusher DVD to iPad Converter is designed for Apple iPad users to watch DVD movies on your iPad?s Multi-Touch screen.With this DVD to iPad converter, you can rip DVD to iPad H.264 (SD and HD), MP4, MOV,and MPEG-4 videos in different resolutions. Download free pdf joiner software combine multiple pdf files even on Windows 7. Program is robust and easy to use to concatenate multipage documents together, pdf merger add & append pages, join secure & password protected files. Upload multiple files to SharePoint 2007 is done securely & effectively by the help of PCVITA Express Migrator for SharePoint, download upload multiple files to SharePoint utility for testing and evaluation purposes. This software offers a solution to users who want to search one or more MS Word documents for the same string, simultaneously. This search can be either case sensitive or case insensitive. This site does not contain serial number, crack, keygen PDF to Image Converter Developer License serial number : serial number is the simplest type of crack. A serial number(cdkey,product key,etc) is register the program as you may already know. a crack or keygen may contain harmful software. If you cannot find the exact version you want, just give it a try. for more information read .nfo/.txt/.diz file include in zipped file.